Run by Royal Caribbean International, Liberty of the Seas is the second largest cruise liner in the world. 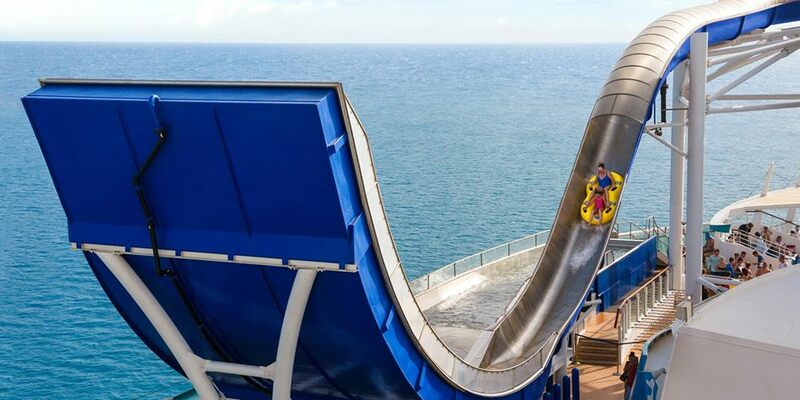 This new waterslide on the Liberty is probably the most terrifying ride on a cruise ship, where you feel like you're going to fly off the ship, but don't worry about wetting your pants as you can blame it on the waterride. You'll thank the higher powers each time you survive. Personally, the only way I'd partake is by watching it from an inside lounge whilst sipping a mojito. Here's my first glimpse of the Liberty of the Seas after stepping out of my taxi in Barcelona (where I'd stayed at the Eurostars Grand Marina Hotel - perfectly positioned in the harbour). Smooth...is this moving...saw the water shimmering in the pool. In my younger years I would drive to Club Mykonos a few days a week to play Blackjack - I insisted on going to Mykonos as it used to be the only casino in South Africa I knew of where they didn't have a shuffling machine (every card-counter's nemesis). So, I leaped at the chance to play in the Blackjack competition - cost $20 to join - there's loads of luck involved and I'm hell of a rusty, but was pleased to come 3rd equal. The ship had 3700 people in it, but at no stage did I feel in the least way crowded. In Barcelona most people couldn't speak English, even taxi drivers, shop keepers in the tourist area and some of the staff at our hotel - I cant speak Spanish or Catalan, so who am I to point fingers, but it is something to be aware of. However, on the Liberty of the Seas all the staff could speak English, and a lot of them could speak Spanish (many staff were from Mexico or Nicuragua where its their first language). The cruise director was super fluent in English and Spanish. The most important crew member is your room attendant. Our room attendant was Collin Davis, an awesome Jamaican with a friendly attitude, who I chatted to every day and who even lent me a pair of his socks (to climb the climbing wall). Colin was amazing - Royal Caribbean International look after this guy. We knew we were going to be using tons of internet, so we bought 500 minutes for USD150 (equates to $0.30 per minute). If you don't buy in bulk you pay $0.65 per minute. There are regular Nintendo Wii tennis competitions on board. I joined in one of them whilst we were docked in Naples, and I was the only person taking part. A crew member played with me and proceeded to thrash me (truth be told she gave me a bit of a chance)! If you've got your heart set on watching a certain sports tournament during your cruise, check beforehand if it'll be broadcast. Even a sports event as big as the Rugby World Cup 2011 wasn't aired. The best way to see the ship is to walk its length on each deck. On the 3rd deck we discovered a Karaoke booth, which our 4-year-old loved - we sang "Twinkle Twinkle Little Star" and "Yellow Submarine" - don't think the Beatles would have been impressed, but we had fun. I'm in no way singling out Royal Caribbean or the Liberty of the Seas, it's just that one of the things about the small toilets on planes and ships is that they easily get stinky, and when you're next in line you don't always have the luxury of waiting for the cloud of noxious fumes to clear. A suggestion I've got for airlines and ships is to hang emergency gas masks just outside the toilet for those who have no choice but to enter! Our 4-year-old took an immediate liking to the Aquanauts Club, where there's a special grouping for 3 to 5 year olds. We registered her on the first night and she loved the Dora the Explorer miniature ship. After cruising into Toulon, we left her in the hands of the Aquanauts club whilst we did the boring adult stuff, exploring the town. Six hours later we picked her up, and she was thrilled with the pizza and chips they had for lunch, as well as citing the play dough as being highlights. After leaving her for 5 hours whilst we visited Pisa, I went to pick her up at the Aquanauts Club, and she wanted to stay there longer! This is fully possible, as the Aquanauts Club offers a free service until 10pm (you pay per hour thereafter). We sent in our clothes to be washed, and were a bit disappointed that they took 48 hours instead of 24 hours, as we were desperately short of clean clothes. 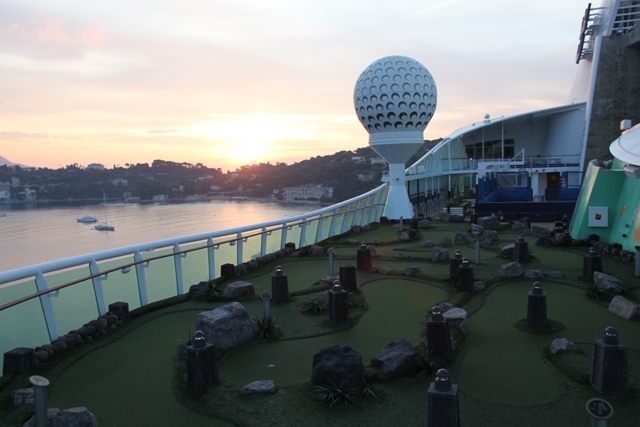 Here's a photo of the miniature golf course at sunrise in Villefranche. There's a running track around the 11th deck, and if you get up at the crack of dawn you'll see the early birds jogging merrily around the track. 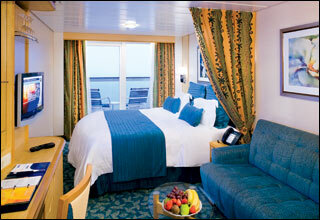 We booked a stateroom with a balcony, which was an indulgence, but so worth it! And here are 2 clickies of the view from our stateroom (on the left is the greenish colour of the sea in the harbour at Livorno, and on the right is the blue colour at Villefranche). I only got round to trying out the climbing wall on our second last day on board. The previous time I'd tried a climbing wall was in an aircraft carrier museum in New York, and I didn't succeed in summitting it, so wasn't looking forward to this. I had nothing to worry about the wall was very scalable and loads of fun. A great way to get a bit of a workout. Our 4-year-old toddler liked this the moment she saw it. Great quality food. I especially enjoyed the mushroom and dumplings dish. The free food is not 5 star - you won't be eating lobster and caviar, but you will eat well. There are some paid options where you can eat better. Also, I found the staff very good at upselling you onto the paid option, because they're just so tempting. Take for example breakfast, it's far more appetising to me to have the freshly squeezed orange juice (which costs extra) than the orange juice from a box. You are not allowed to take videos or photographs at the shows, and whilst I'm a bit of a philistine when it comes to the arts, I can confirm that we saw some amazing acrobatic feats - I wonder how safe it is doing that stuff on a moving ship - I guess that in the Mediterranean the sea is fairly calm, so the boat is unlikely to lurch from side to side. I think for the first time, I got into a cruise video. You either have to do something wacky or get lucky to get into those. I was filmed trying to dip my daughter's feet into the pool! On the final night show the cruise director mentioned how people forget that they're no longer on cruise when they get home. "So you get home, go shower, chuck the towel on the floor. Guess where that towel is going to be when you get home from work?" Happily, for many of us spoilt South Africans, the answer is that our domestic would have picked it up for us.